Heat oven to 350°F. Place muffin pan(s) on work surface face down, and spray bottom(s) with cooking spray. Make cookie dough as directed on pouch. Roll 2 tablespoons dough into ball, and press down lightly to flatten and shape ball on upside-down muffin cup. Repeat with remaining dough, skipping every other muffin cup. Bake 8 to 10 minutes or until slightly browned. Let cool on pan, then gently remove. Place chocolate chips in microwavable bowl. Microwave uncovered on High in 30-second increments, stirring after each increment, until chocolate can be stirred smooth. Use a pastry brush to brush the insides of the cups with chocolate. Let cool at room temperature or in the freezer, then fill with ice cream and toppings. If you don't have enough muffin pans to bake all of these at once, bake a few at a time, keeping the remaining dough covered and in the refrigerator. These cups would also work well for serving fruit, frozen yogurt or mousse! Planning ahead for a party? 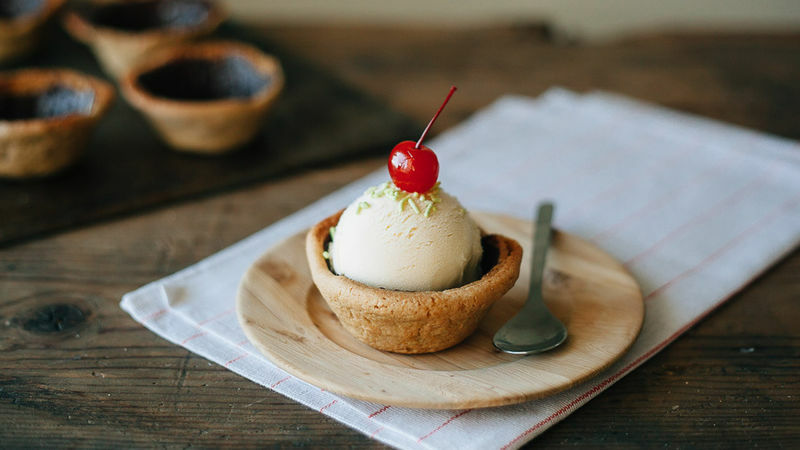 Scoop your ice cream into these bowls up to a few hours in advance, and keep them in the freezer until you're ready to serve.